Outdoor Public Showers are located at the Lifeguard District Stations and the casino Beach Bars have showers available for public access. Restrooms are located at several locations along the Boardwalk at: Bartram Ave., Albany Ave., Chelsea Ave., Kennedy Plaza at Mississippi Ave., New York Ave., Garden Pier at New Jersey Ave., New Hampshire Ave., and Caspian Ave.
ADA compliant restrooms are available at Caspian Ave.
A limited number of Handicap surf chairs are available free of charge on a first-come-first-serve basis at Beach Patrol stations located citywide. Surf Chairs can accommodate up to 350lbs. There are no bathhouses in Atlantic City. Make the trip to Atlantic City and enjoy one of the best free things to do in New Jersey! 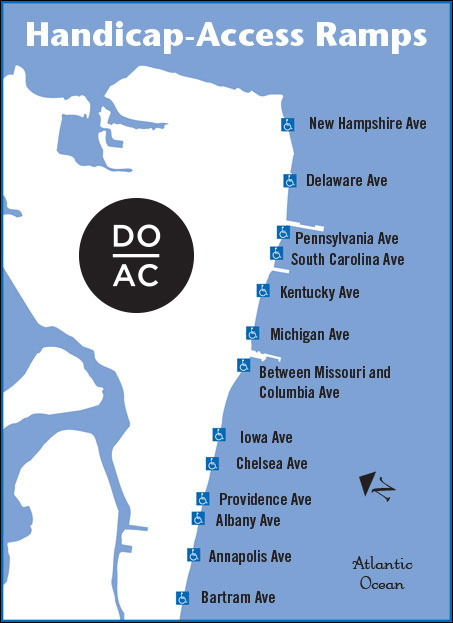 You’ll find all of the handicapped-accessible beaches below on our Atlantic City, New Jersey beach map. Start planning handicapped- and wheelchair-accessible vacations in Atlantic City today!